Camp directors will be on hand to provide overviews of all programs and answer questions. Tours of MCCC's extensive facilities will be available, including computer labs, television studio, Olympic-size swimming pool, tennis courts, cafeteria and more. Mercer's summer camps enable children and teens to pursue their individual talents and explore new interests. Camp College provides an enriching alternative to traditional summer camp in two four-week sessions. Campers ages 6-12 can create a personalized schedule from more than 60 subject offerings, with new courses in the arts and computers added for 2014. Camp College also offers one-week Specialty Camps for ages 6 through 17 in science, technology, cooking, crafts and more. A second session of the highly popular Aviation and Aerospace Academy, held at Mercer Trenton Airport, has been added to the schedule. Camp College also offers a Counselor-in-Training program for teens ages 15 and 16. Mercer's Sports Camps, for ages 6 to 15, offer one-week sessions in nine popular sports and are taught by high school and college coaches, as well as college athletes. Camps include baseball; basketball; field hockey; golf; mountain biking; soccer; softball; speed, agility and quickness; and tennis. Sessions begin June 23 and conclude August 15. 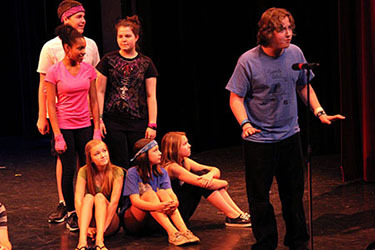 Tomato Patch Visual and Performing Arts Workshops give students entering grades 5 through 12 a multidisciplinary experience in theater, dance, vocal music, visual arts and video. Workshops will be held June 23 to July 17 for grades 8-12 and July 21 to Aug. 7 for grades 5-7. Older students may follow their first session with a Master Class that covers the business of show business, including job searches and auditions. Additional details about MCCC's summer youth programs are available at www.mccc.edu/camps or by calling 609-570-3311. Camp College will host three additional information sessions on Feb. 15, March 22 and April 26 from 12 to 2 p.m.
Camp employment opportunities are available for teachers, counselors ages 17 and up, lifeguards and swim instructors. Call 609-570-3311 or email campcollege@mccc.edu. Tomato Patch choral students rehearse for their 2013 Festival of the Arts performance. 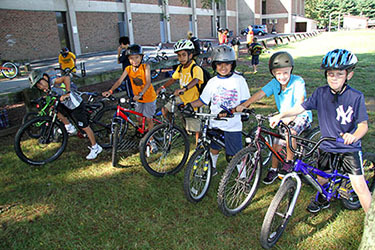 Campers in Mountain Biking Camp ride trails in Mercer County Park and also learn safety tips and bike maintenance. 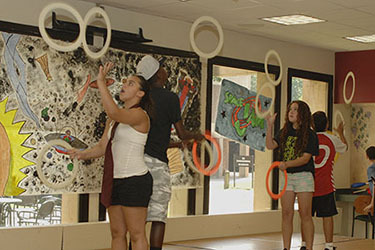 Camp College teens display their juggling skills in the 2013 Variety Show. 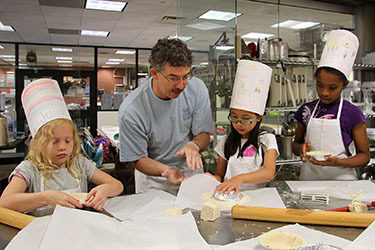 Faculty member Doug Fee teaches budding chefs in the "Kids in the Kitchen" Specialty Camp.